“Tetsuya Yamada”—the artist’s first major showing in a New York gallery—opens at Francis M. Naumann Fine Art on March 16, 2007. The title of the exhibition—“Morice”—refers to the name that Constantin Brancusi and Marcel Duchamp used when addressing one another, a term of endearment they allowed only select individuals to share, and which they used for themselves throughout the many years of their long friendship. The term is appropriate for Tetsuya Yamada’s new series of sculptures, for in these works, the artist ingeniously combines an element taken from Duchamp—a white porcelain shape (referring to the urinal, the notorious plumbing artifact that he submitted to the 1917 Independents Exhibition in New York)—with a vertical support that reflects the simple but refined geometric forms of Brancusi’s sculpture. Yamada’s bases are not hewn from sold pieces of wood, but, rather, are made of cut and constructed planes of plywood that, in some cases, mimic the serrated pattern of Brancusi’s famous Endless Column. 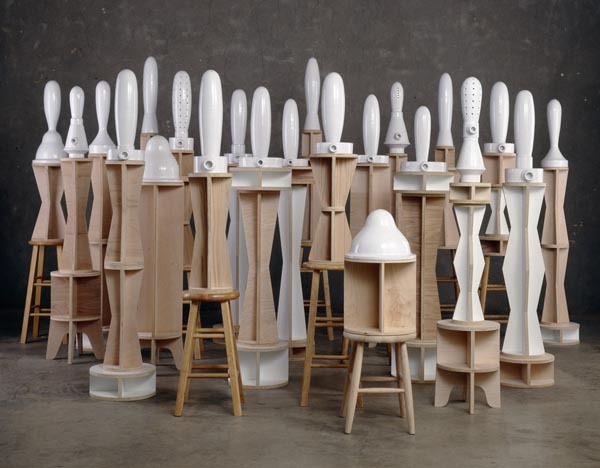 In a number of Yamada’s sculptures, the porcelain element takes on the appearance of a urinal turned inside-out and, in other instances, he appears to have stretched the shape vertically, an attenuation that causes the resultant form to resemble Brancusi’s Bird in Space (and, like many of Brancusi’s sculptures, takes on a decidedly phallic appearance). Several sculptures are supported by an ordinary kitchen stool, reminding viewers of Duchamp’s Bicycle Wheel. In all, Yamada has produced some 45 variations on this theme, the whole resembling a forest of totemic sculptural artifacts, which, when grouped together (as they are in this exhibition), recreate the experience of walking through Brancusi’s studio (which is still possible today, for the building has been reconstructed in the courtyard of the Musée National d’Art Moderne, Centre Georges Pompidou, Paris). Surrounding the assembly are twelve black-and-white photographs of individual sculptures, and groupings in the artist’s studio taken by Renee Cattelan, who has accurately captured the spirit and sensitivity that Brancusi himself employed when taking pictures of his own work. The exhibition features a fully-illustrated 28-page catalogue, with an introductory essay by the distinguished author and art critic, Arthur C. Danto.